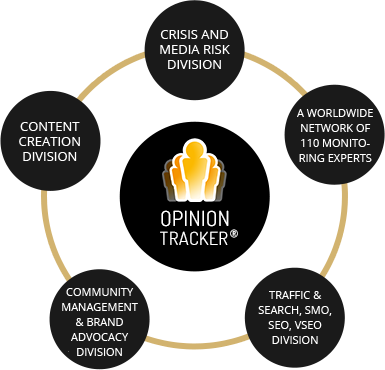 In addition to our Competitive Intelligence tool OPINION TRACKER®, Groupe 361 offers brands a complete system to animate and manage their ereputation. The various departments of the agency complete the tool to go further. Once we identify trends, influencers or social networks to follow, we can build a complete system to engage a conversation through community management actions, turn your customers into brand advocates, create new custom-made contents, define a complete strategy of trafic and search or organize a whole action plan to help you to manage a crisis.